The Cantankerous Crow by Lennart Hellsing and Poul Strøyer is a retelling of a classic Swedish tale from the 1950s. Both Hellsing (1919–2015) and Strøyer (1923–1996) were seasoned professionals in Sweden and Denmark where Hellsing wrote over 100 children’s books and Strøyer was a renowned illustrator for a Swedish daily newspaper. Their professionalism shows in this beautifully presented edition. At the very outset we are introduced via a whimsical Strøyer illustration to a crow family with four sisters and one brother. The sisters all have their artistic pursuits: one sings, one writes, one cooks, and one is very interested in building houses. But the brother crow, the cantankerous one, does nothing but eat cherries off the farmer’s trees. Inevitably, he is caught, caged, and forced to work chores around the farm, which he completely blunders. The farmer sees the crow as more of a liability and offloads him one day at the market. The crow is traded to a baker and proven to be as much of a nuisance in the bakery from which he is resolutely ejected. With no other ideas, the crow returns home to find that his sisters actually missed him. They welcome him home in their own artistic ways, and they all live happily ever after. There is no denying that the illustrations are spot on. The retro feel and color choices blend well with the expressions of each character and the action of the story. Especially notable are the fat rooster, the angry farmer, the bustling market, and the pretzel-strewn bakery. Every page delivers a unique image with creative perspectives. Within the illustrations we actually get the feeling that this crow is having a delightful time, almost the prankster. We see him rambunctious, rollicking, vivacious, boisterous. He is most certainly smiling his was through all of his innocent antics, which makes us wonder why he is called cantankerous. In contrast, the farmer and the baker both are drawn out surly, ill-tempered, ornery, and annoyed when they interact with the crow, making them more worthy of the adjective than the crow. 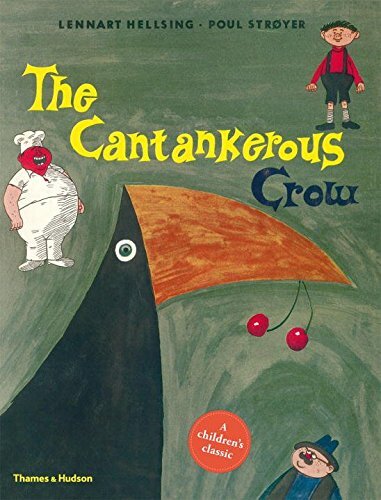 The crow, it seems, is called cantankerous because he is prone to induce “cantanker” in others. The story itself is interesting. It flows well, and connects the beginning introduction of the sister crows with the end homecoming. It has aspects of a traditional tale of a character getting into trouble, going out away from the trouble, learning something about himself and the cause of his trouble, and then returning home a changed individual. However, we don’t really know what the crow is learning from all of his mishaps. We have no idea if he has resolved to not eat the farmer’s cherries. Has his character changed? We don’t see him doing anything different. At the most, we see his family very happy that he is home safe and sound. In putting together a children’s book there are naturally two elements: the illustrations and the story. Where in The Cantankerous Crow we have first rate illustrations pared with a somewhat limited plot, we also have an additional element: the translation. This story was originally written in Swedish over 60 years ago. If in the original Swedish language version there was any poetic or rhyming intention, it did not translate very smoothly. The rhymes are crude, simple and at times forced (cat/rat, mad/bad, cake/bake) with some clunky syllable counts and phrase groupings that detracted rather than added to the flow and pace of the story. This is a case where one wishes one could read the original version, in its original language, because there might be a greater richness there. In any case, the quirky translation adds to the overall vibe and a funny folktale story is indeed what we find in The Cantankerous Crow. One can imagine Swedish farmer families from a different era sitting around the dinner table laughing at how they foiled the crows that day, trying to out-do each other with extremes of mischief and trickery—something like a fisherman’s tale where the size of the fish continues to get bigger with every telling of the story. Far from being thwarted, this cantankerous crow probably grows more and more clever with each reading.